Nixon Motor Sports: Need a New Car? Your Choice of Colours at McLaren! The NMS team is made up of car fans, and while there is nothing like a new car, there are just TONS of used cars out there in the world, and they tend to be way cheaper than all the new cars. Most of us are familiar with the big three from Detroit of Ford, Chevrolet, and Chrysler (now part of FIAT), as well as all those other makes from Germany (Audi, BMW, Mercedes, Porsche, VW, etc), England (Lotus, McLaren, Bentley, Rolls Royce, etc), and other countries. NMS North was recently visiting Long Island (which is REALLY long, over 100 miles, that place is appropriately named!) 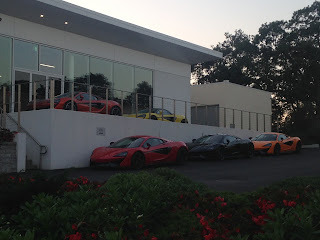 and without even trying, we managed to drive right by dealers from Ferrari, Rolls Royce, Lamborghini, and Bentley. Yes, we love being around cars that cost more than our house! To top all of those brands, our hotel was right next to Long Island Sports Cars, which is made of two more automobile brands, both of which are built in Great Britain. With Aston Martin and McLaren sales available in the same building, I'm thinking this is a nice part of town! Too Many to Park Inside: Buy One Today! Maybe there is a very beat up, rusted, hulk of an old Aston Martin out there that we could afford, but I'm afraid the reality is that the fantasy of walking into this place and buying a new car is not going to happen anytime soon. It would be a blast to win the lottery and go buy a new McLaren, mostly because you could drive over to Little Caesar's and get your 5 dollar pizza home REALLY FAST! Bottom line, it was fun to even see these cars, and much more interesting than the rental car Hyundai Elantra we were driving. Nothing wrong with the Hyundai either.